When French painter Claude Monet submitted his painting, The Magpie, to the Paris Salon of 1869, it was so radical that the jury turned it away. Its modest subject, a magpie in the snow, was inappropriate for a canvas so large - 89 by 130cm - as paintings of such size were reserved for religious, mythological or historical subjects. Nor did Monet paint the snow as purely white. He painted it in the colours of the shadows his eye observed falling upon it - blues, yellows, purples, changing as the light changed. Paintings such as The Magpie would go on to revolutionise art history by ushering in the Impressionist movement, as a new wave of artists in the late 19th century strove to capture the changing light of their rapidly modernising world. The Magpie is among more than 60 Impressionist masterpieces at the Colours Of Impressionism exhibition, part of the Century Of Light showcase at the National Gallery Singapore. Along with Between Worlds: Raden Saleh And Juan Luna, an exhibition about these two 19th-century South-east Asian artists, it opens at the Singtel Special Exhibition Gallery on Thursday. The paintings are on loan from the Musee d'Orsay in Paris, one of Europe's leading art museums. 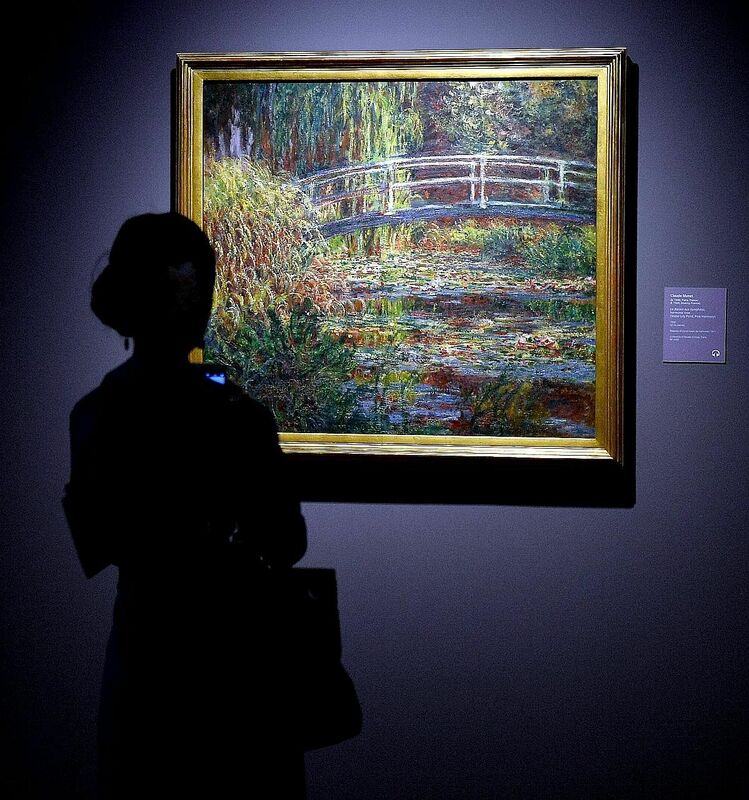 They include masterpieces by the likes of Edouard Manet, Pierre-Auguste Renoir and Paul Cezanne, as well as 10 Monets. The Musee d'Orsay lent 145 works to the National Museum of Singapore in 2011, but this will be the first exhibition here to focus specifically on the Impressionist movement. Mr Russell Storer, 47, the gallery's curatorial and collections deputy director, says: "Our goal is to introduce our audience to major movements in art history. Impressionism is the beginning of modern art and everyone has heard of painters like Monet, but not everyone has had access to his works." It is rare for the Musee d'Orsay to lend paintings such as The Magpie or Monet's Rouen Cathedral series, which are so popular that people often travel to Paris for the purpose of seeing them. Musee d'Orsay curator Paul Perrin, 31, says: "I hope they give people here a more accurate understanding of what Impressionism is. It's not just pretty pictures of the French landscape, but a very modern approach to reality, colour and painting. "It is a pleasure for us to share the collection. We would like it to be seen by people who may never have been to Paris or had the chance to visit our museum." The term Impressionism derives from a negative review of Monet's hazy painting Impression, Sunrise (1872). In defiance of the regulations that governed academic painting, Impressionists moved out of the studio and into the open air, inventing new techniques and drawing on scientific colour theory to capture not so much precise scenes, but rather mood and atmosphere through the fleeting effects of light. 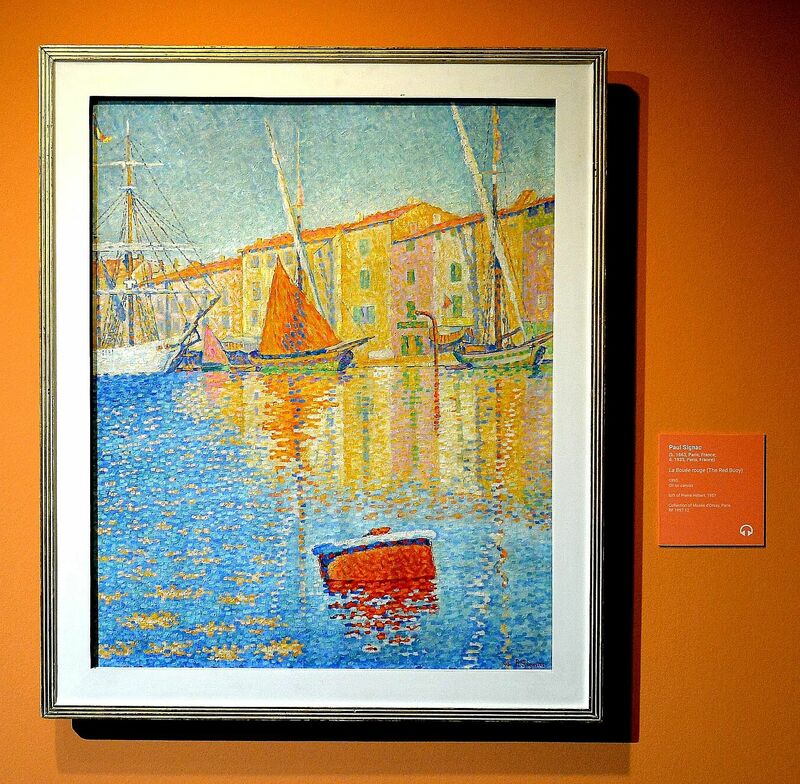 Teacher Amal Luqman, 28, was intrigued by Signac's work at an exhibition preview. "From afar, it looks solid, but when you look closer, it's made of dots. It reminds you that everyone around you is made up of particles. "It's a good introduction to the Impressionists," he adds. "It gives you a clearer picture of the movement and makes you think about the other paintings from the period that you may have seen before." "We are the sons and daughters of the century of light," wrote a journalist in a note to Filipino painter Juan Luna. "Let us be the descendants of light." By Raden Saleh This painting is characteristic of Saleh's Orientalist style and fascination with animal violence. In it, a terrified horse leaps off a precipice as a lion bites its neck, while its rider raises his scimitar to strike the predator. 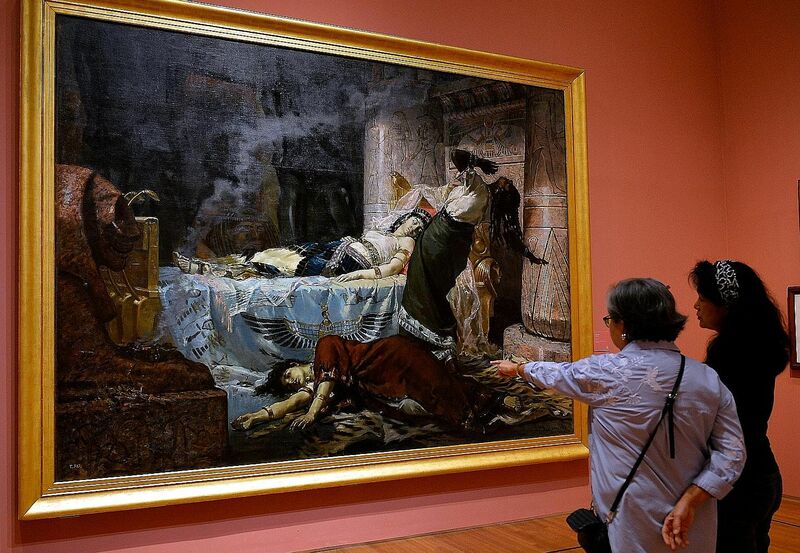 By Juan Luna In this huge, dramatic painting, the Egyptian queen Cleopatra lies dead on her bed from the bite of an asp, with one of her handmaidens, Iras, dead on the floor while the other, Charmian, is reeling from the poison. The asp can be glimpsed slithering away behind a column in the right of the painting. By Claude Monet This is one of 12 paintings Monet made of the water lily pond in his garden at Giverny from the same vantage point, but under different conditions of light. The sky is absent and the water seems fused with the profusion of plants in it, but texture emerges from the diversity of Monet's brushstrokes. 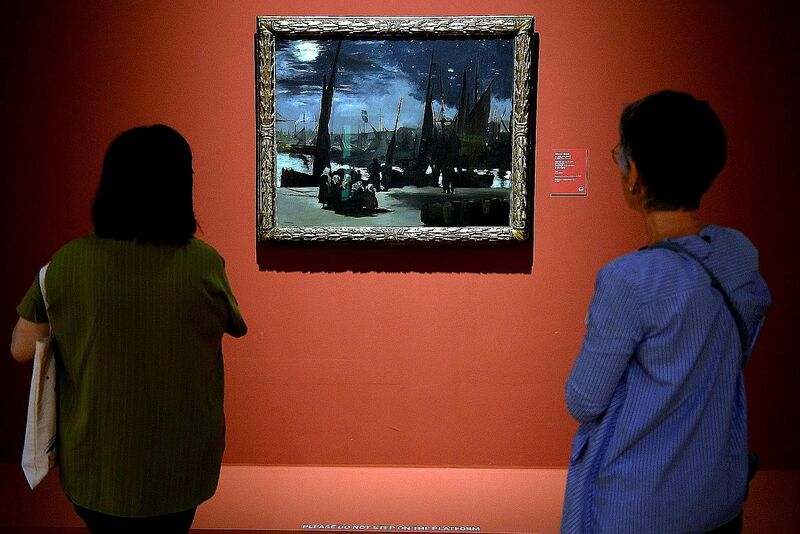 By Edouard Manet In this painting, Manet uses black shades and free brushwork to render the misty port at night, as a group of women in white headdresses await the return of the fishing fleet so they can prepare the catch for market. 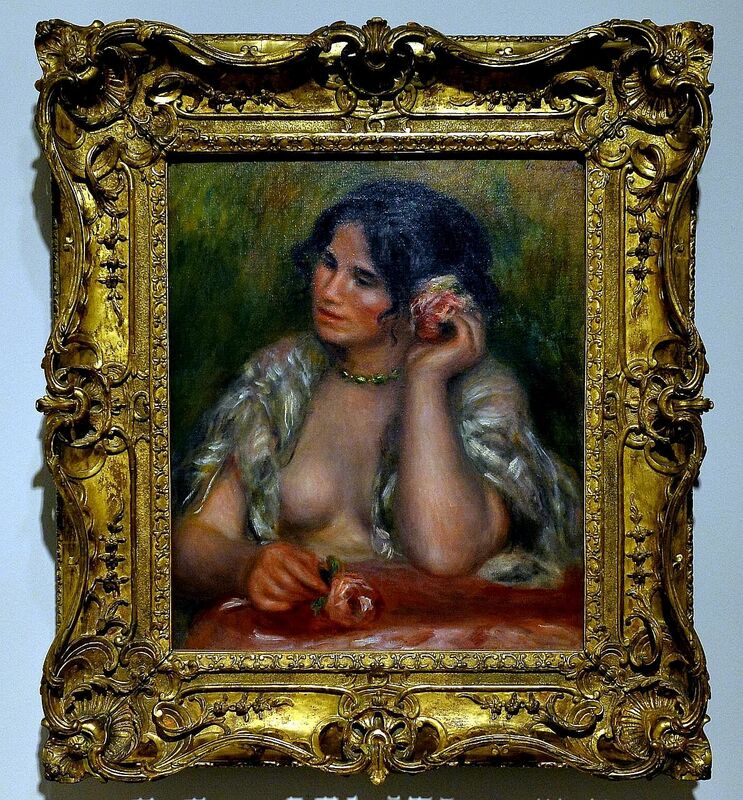 By Pierre-Auguste Renoir This warm portrait of Renoir's cousin-in-law Gabrielle Renard is characteristic of the artist's late style. His palette is limited to fewer than 10 tones and there is very little colour mixing to ensure the brilliance of the shades on the canvas. The phrase "century of light", which Luna also used in a letter to a friend to describe the rapidly changing times they lived in, has now been adopted as the title of the National Gallery Singapore's new blockbuster showcase on 19th-century masterpieces, opening on Thursday. One of the showcase's two exhibitions is Between Worlds, which features Indonesian painter Raden Saleh (1811-1880) and Luna (1857-1899), two of the most prominent South-east Asian artists of the 19th century. Born nearly 50 years apart, both were considered national heroes in their home countries and went toe to toe with their Western counterparts in Europe. More than 100 of Saleh and Luna's works and archival materials will appear together for the first time in the most comprehensive exhibition combining the two artists to date. The curators spent four years gathering them from 17 museums around the world, including the Museo Nacional del Prado in Madrid and the Smithsonian American Art Museum in Washington, DC, as well as private lenders. Some are going on public display for the first time. Mr Russell Storer, the gallery's curatorial and collections deputy director, says this exhibition is meant to complement Colours Of Impressionism, which features masterpieces from the Musee d'Orsay in Paris, by exploring the dynamics between South-east Asia and the world in the 19th century. "It's a never-to-be-repeated kind of show because of the complexity of bringing all these works together in one place," adds Mr Storer, 47. Saleh was the first Indonesian artist to receive training in Europe. He first travelled to Antwerp as the assistant of a civil servant and remained in the Netherlands for a decade. Presenting himself as a "prince" of Java, he rose to the high echelons of Dutch society, acquiring noble patrons such as the Duke of Saxe-Coburg and Gotha, and was even conferred the title of King's Painter by King Willem III of the Netherlands. He began painting lions after watching the shows by French animal tamer Henri Martin in The Hague and Haarlem, and this later led to the Orientalist paintings he became acclaimed for, especially his violent depictions of animals fighting and hunting. Museum volunteer Radiah Zainal, 32, who is interested in Saleh's work, was pleased to see so many of his paintings available in one place. "Even in Indonesia where he lived, it is difficult to see more than one of his works at a time," says the project manager. "Seeing them all together is very nice." Luna, who trained initially as a nautical pilot and went on to study art in Madrid and Rome, won the First Class Medal in Spain's national art exhibition in 1884 with his painting Spoliarium, of defeated gladiators being dragged past jeering crowds into the basement of the Roman Coliseum. The gallery's curators "dared not even ask" to borrow Spoliarium, which now hangs in the National Museum of the Philippines. It is absent from the exhibition, as is Saleh's most famous work, The Arrest Of Prince Diponegoro (1857), which is kept in the presidential palace in Jakarta. Diponegoro was considered the spiritual leader of the Javanese during the Java War and Saleh's painting of his arrest by the Dutch officers has often been interpreted as anti-colonial. The gallery did, however, manage to borrow Luna's work Cleopatra, rarely seen by the public, from the Prado. It won Luna his first major prize in Europe, when it was awarded a Second Class Medal at Spain's national art exhibition in 1881. Curator Clarissa Chikiamco, 34, who is from the Philippines, says it was "very emotional" for her to see this work in person. "There were moments when we were putting it up that I was close to tears." She hopes the absence of Spoliarium and The Arrest Of Prince Diponegoro from Between Worlds will help audiences better appreciate the diversity of the artists' other works, such as Luna's 1891 realist masterpiece, The Unknown Ones, which features the funeral of a poor, unknown person. Luna, who had begun to find historical painting "false and insincere", turned to realism in the late 19th century to better reflect everyday life. Despite their successes in Europe, both ran afoul of colonial tensions back home. Saleh was mistakenly arrested on suspicion of having participated in a rebellion in 1869, while Luna was arrested in 1896 for his revolutionary associations. Before that, Luna also went on trial in Paris in 1892 for shooting and killing his wife and mother-in-law after suspecting them of plotting a divorce from him. He was acquitted on the grounds that it was a crime of passion. Despite their very different styles, both artists faced the same struggle of achieving cosmopolitan success in Europe while trying to represent their homelands. "Between these two worlds, my heart is split," wrote Saleh in a letter. "And I feel urged to offer both sides my loving thanks."